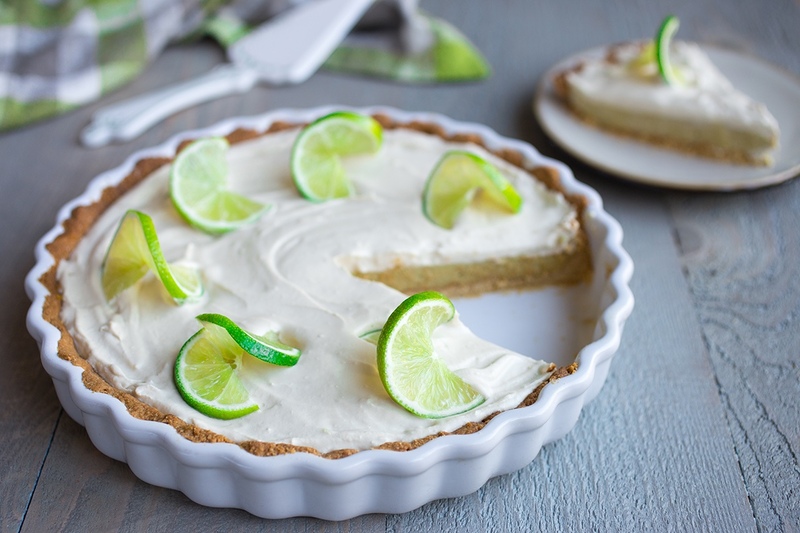 To be honest, I’ve never been the biggest fan of Key Lime Pie. I’ve always “liked” it, but had never fallen madly in love. Having said that, it’s my fiancé Chris’ absolute favorite dessert so it was only a matter of time before I decided to make one that was paleo-friendly and dairy free. 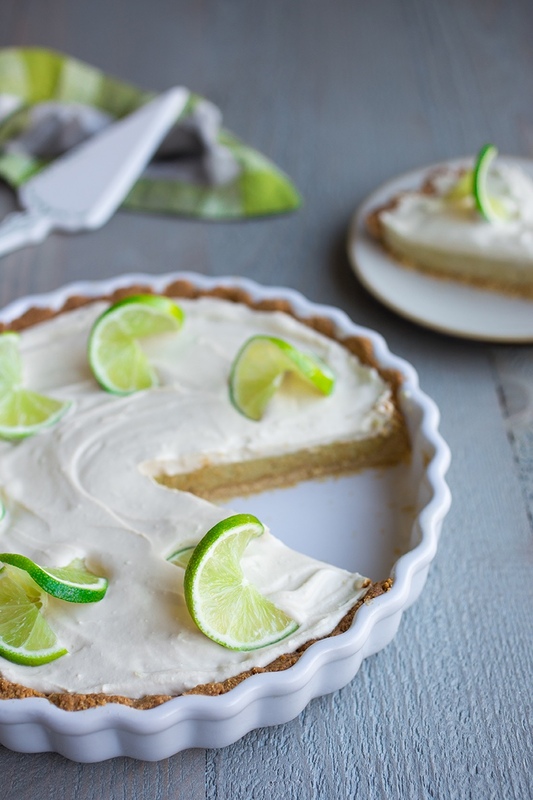 To my surprise, not only was I am to accomplish making a delicious, whole food version, but I also devoured the first slice… it was so much tastier than any other key lime pie I’d had! This recipe uses the same crust as my Marbled Chocolate Pumpkin Pie and can be adapted to sub out the ghee for coconut oil, making it 100% dairy free. Personally, I do okay with ghee so I am comfortable leaving that in but if you’re very sensitive to dairy, I suggest using coconut oil instead. The results will be just as delicious! To top off this delectable pie is coconut whipped cream. Ie, the most delicious whipped topping you will ever taste. Personally, I find it to be so much creamier and satisfying than regular whipped cream, which can sometimes be too light and flavorless. 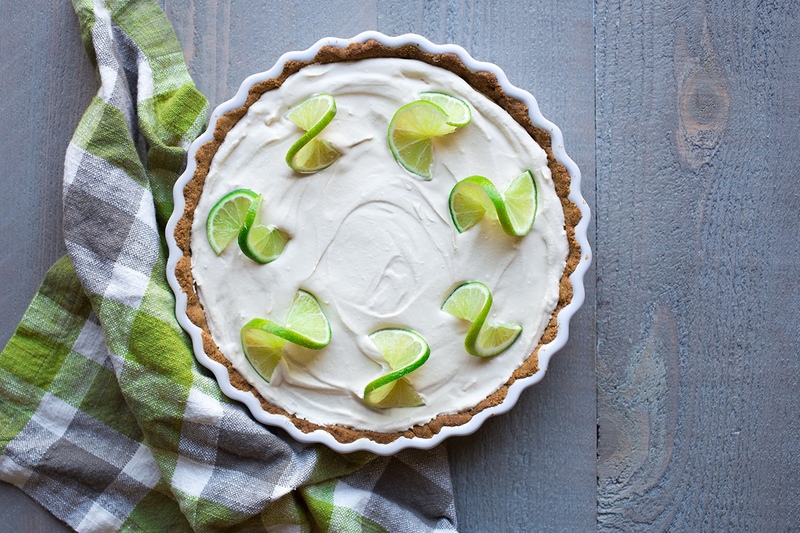 Coconut whipped cream is rich and flavorful making it the perfect companion for the zing of the lime-infused pie. 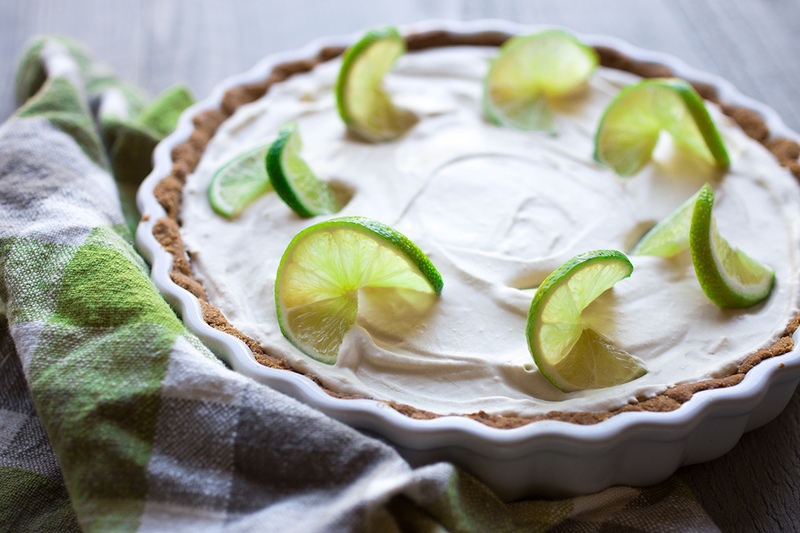 Although this pie is traditionally made with key limes (mini limes that can sometimes be hard to fine), regular limes work just as well so don’t worry about traveling to multiple stores to try and find the real thing. ¾ cup cashews, soaked for at least 3 hours or overnight and drained. Combine all crust ingredients in a mixing bowl and kneed until fully combined and mixture resembles a dough. Press dough into a 9" pie dish. Bake pie crust at 350° for 20 minutes or until slightly browned. While the crust is cooking, combine the lime zest, lime juice, gelatin, coconut oil, vanilla and coconut nectar in a sauce pan and heat until the mixture just starts to boil, stirring regularly. Once the mixture is hot, remove and combine with soaked cashews and avocado. Combine heated mixture with cashews and avocado using a immersion blender. If you don't have an immersion blender, a high-speed blender would work just as well. Once mixture is fully blended (make sure there are no remaining cashew pieces, everything should me smooth), pour into pre-baked pie crust and place in the fridge to cool. While the pie is cooling, prepare the coconut whipped topping by removing just the fat from the top of the coconut milk. The fat should be fully separated from the rest of the coconut milk as it was chilled. Reserve the rest of the coconut milk for later use. Combine the fat from the two coconut milk cans with the rest of the whipped topping ingredients and use a stand mixer or hand mixer to combine until creamy and fully whipped. The mixture will be thicker than regular whipped but should be completely smooth. Remove the pie from chilling in the fridge and gently spread the coconut topping on top. You may have a bit extra topping which is fine... save for later use or simply lick the bowl! Return pie to fridge to cool and set for a few hours. The longer the pie cools, the firmer it will be and the easier it will be to slice. Top pie with sliced lime rounds (optional). Is there a comparable substitute for the cashews? Would almonds work in the same quantity? It wouldn’t be quite the same, but you could always try!